The 10oz food jar's leak proof lid lets you bring hot or cold foods anywhere. It’s large mouth opening lets your kids eat directly from the container as well as making filling and cleaning super easy. The 10oz food jar's leak proof lid lets you bring hot or cold foods anywhere. It’s large mouth opening lets your kids eat directly from the container as well as making filling and cleaning super easy. This jar keeps hot food for up to 5 hours while staying cool to the touch and keeps cold food for up to 7 hours while remaining condensation-free. 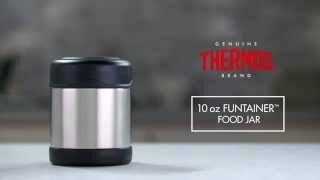 Lastly, the Thermax double wall vacuum insulation locks in temperature to preserve flavor and freshness. •Kid-proof design: Unbreakable stainless steel interior & exterior to withstand daily wear & tear- A GREAT ALTERNATIVE TO PLASTIC PRODUCTS!